Some movies end with "Thank You!" instead of "The End", and the epic, dismal, nominally "feminist" misfire that is Lajja (Shame) should give us some gratitude too, wethinks. Gratitude for sitting through three hours and twenty minutes of a relentless, ham-fisted grotesquerie about the Plight of Women, where the scenes swing from fantasy-style empowerment to incredibly distressing violence. We'll just say up front that we found the recent Chak De! India and the zany, emancipated Beta much more succesful feminist Hindi films. Lajja, for however hard it tries, ultimately left us with a bad taste in our mouth - it wasn't challenging, subversive or uplifting. It was just angry and angering. In short, Lajja was to misogyny what Dhan Dhana Dhan Goal was to racism: both films tackle an unsavory, real life topic in a clumsy and ultimately ineffectual way. 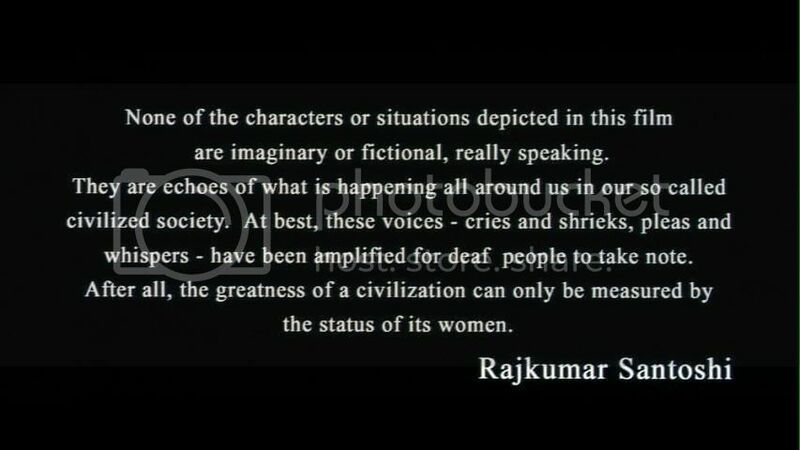 Last line, in particular: "After all, the greatness of a civilization can only be measured by the status of its women." Ahem. Okay. Right. This annoys us because why can't society also be measured by the status of its men? Why are women relegated to this "special" role, serving as representative tokens? In particular, the film itself criticizes Indian culture's "hypocrisy" in putting women on a pedestal - for example, Sita of the Ramayana, or the eternal "Maa" of filmidom - worshipping them while simultaneously imprisoning them in highly restrictive ideals of purity, chastity, morality, and so forth. Yet the film seems to suffer from this very thing, if we're measuring freaking civilizations by the size of that pedestal! Also, very importantly, notice that the harrassed heroine, Vaidehi (Manisha Koirala), is a stereotypical filmi Good Indian Wife: that is, she is distressed not only by her husband's physical abuse and philandering - as anyone would be - but she is also alarmed by seeing her emancipated friend, Janki (Madhuri Dixit), drinking, smoking and whistling. And the Good Indian Wife gets the happy ending, whereas Janki is the victim of mob violence! We got the distinct feeling that, as much as director Santoshi wanted to emancipate and empower women, he still suffered from that particularly male-centric desire to define the terms in which women can be emancipated. Apparently it's okay to want to be free from domestic abuse, but it's not really okay to try things, have vices, make mistakes or, gosh, not want children (shudder at the thought!) as every woman in this film is associated with being a (potential) mom. The odyssean tale begins with Vaidehi (a gloomy Manisha Koirala), imprisoned in the first ring of misogynistic inferno: her husband, the schmoozy, boozy Raghu (Jackie Shroff), gives her a lot of material wealth and a lot of problems. He openly flirts with other women and hits Vaidehi behind closed doors. When Vaidehi finds the strength to escape, she flees to her parents' home in India - and her parents, in what will become a running leitmotif of the film, offer practically no sympathy and urge her to return to Raghu. Meanwhile, Raghu has been in a car accident and found that he's sterile and Vaidehi is pregnant. His desire to track Vaidehi down therefore becomes much more intense, as she becomes - clang! another blunt note! - importantly and merely a "baby-producing machine" that he can dispose of once the baby is born. He sends his two goons (a highly restrained Johnny Lever and Razak Khan, thank goodness) to track her down. Vaidehi now runs around the subcontinent fleeing from her evil husband's evil goons' evil clutches. And along the way, she runs into every Representative Problem of Indian Women that director Santoshi could think of. First: dowry. Vaidehi gate crashes a wedding in order to hide from the cops. There, she runs into the first (of two) good guys, the thief with a heart of gold, Raju (a very cute Anil Kapoor), as well as a gaggle of unexpected 1970s masala comedians (Asrani! Jagdeep! a Johnny Walker lookalike!). 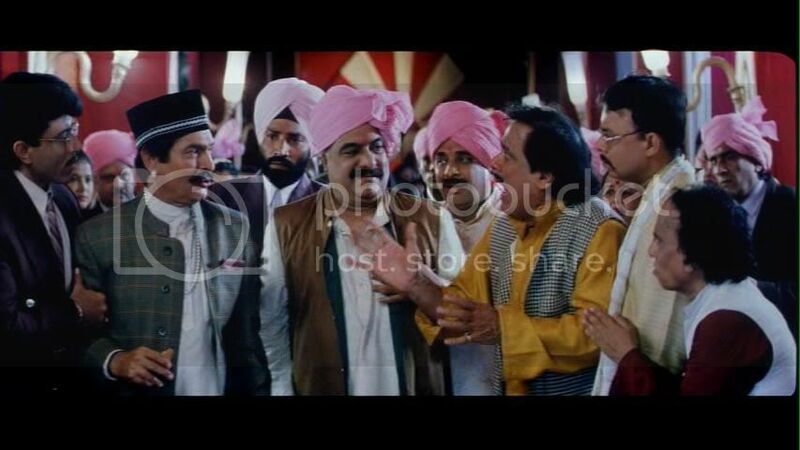 Vaidehi and Raju and the comedians witness the evil conniving of the groom's family as it tries to extort as much dowry money as possible from the harried father of the bride (Anjan Shrivastav). A special note about Asrani: he looks AMAZING for his age! A special note about Jagdeep: we secretly hard-core love Jagdeep and think he was an untapped potential of humanistic, tragicomic genius. We have also decided that he will be playing Anil Kapoor's father in the film we're writing. You made Sita cry! BESHARAM! Anyway, third problem: infanticide (and a little wollop of casteism). Vaidehi's next stop is in a tiny village ruled by an evil thakur type, Gajendra (Danny Denzongpa). The village's midwife, Ramdulaari (Rekha), is progressive and empowered - uh oh, this doesn't bode well in a film where all except two of the male characters are violent, stupid and evil. As Ramdulaari welcomes her computer geek son back from university, she is horrified to learn that he has fallen in love with Gajendra's daughter. This gives Gajendra the perfect pretext to get rid of Ramdulaari once and for all. Yet with the arrival of the second (of two) good guys, the dacoit with a heart of gold, Bulwa (a very studly Ajay Devgan), a full-scale dishoom dishoom is unleashed. The remaining half hour of the film sounds like this: dishoom! whack! aarghhh! wahh-pshhhh! splash! gurgle! thump! And the PPCC of course: siiiigh. Just when we were thinking, "Hey, it's been over an hour and no sign of Anil or Madhuri. Did Santoshi just forget about them!?" Santoshi proves that, no, he didn't - as he ties everything up, a little haphazardly, in a hasty "happy" ending. Man, we wish we could just chill out with Rekha sometimes. We've already described the film's main problem above. Basically, it's a dangerously oversimplified, one-sided view of a complex and deep-rooted problem. In this film, all women are pure, virginal and true, and all - except two - of the men are either stupid, evil or both. While Santoshi's disclaimer notes that things have been "amplified for deaf people to take note", we think he undermines his own message by being so "loud". Awful things happen to women in this film, and it seems like anything less than perfection - both in terms of personal strength and purity - is severely punished. Often, even perfection itself isn't enough, and then it's up to Anil Kapoor and Ajay Devgan to sweep in and save the damsels in distress. Manisha and Madhuri. One of the few moments when they're not CRYING ABOUT BEING A WOMAN in this evil man's world. Which segues nicely into a note about the two sole "good guys". We thought it was interesting that both good guys are "anti-socials", a thief and a dacoit, operating outside of the system. Way to the stick it to the Man! Anil's Raju openly criticizes the establishment as a hateful society, noting that going to jail would be a respite from its wretchedness (ha! we liked that line, btw), while Ajay's Bulwa seems to embody a fiercely independent (notable in itself) and proto-feminist Jai Santoshi Maa! mentality. One of the most notable scenes (slight spoiler), we think, is when Bulwa has the chance to behead Raghu the evil husband. As he raises his machete, Vaidehi screams in horror. Bulwa stops himself and, angry, bellows at Vaidehi that "you women are your own worst enemies!" and only an "Indian woman" would still be apalled by the decapitation of her clearly evil husband. We think this scene is interestingly saying that Indian women's culturally-approved devotion to the sanctity of marriage (sometimes embodied in their inability to remove their mangalsutra or, you know, watch their husband get decapitated without flinching) is against their own interest. A fascinating, weird scene. Shameless Ajay Devgan pic, but, goodness, he looked divine in this film. STUD! And Good Guy #1. 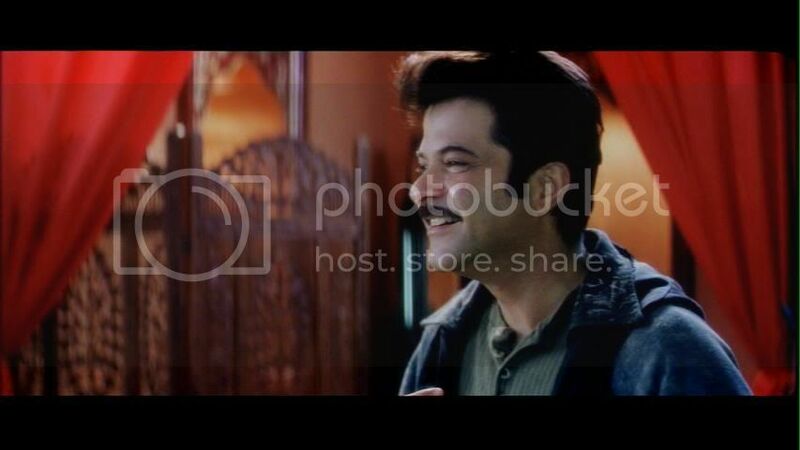 That said, our heart belongs to Anil Kapoor these days. Awwww! Good Guy #2. Dilsquish!! We wanted to like this film, because anything pro-woman gets big brownie points at the PPCC. Unfortunately, we found this like a much more bloated Mirch Masala - a facile, unhelpful look at "how women suffer". We highly recommend, however, that you watch it yourself as it can certainly stimulate useful debate. Okay, I've watched this movie and the only debate I want to have is why you would want to inflict it on anyone. What evil lurks in your heart, P-PCC? You must be a man (dun-dun-DUN!). This movie was atrocious- beyond horrible, ugly, weird and disgusting. I am so sorry the actors didnt read the script properly before signing up! Hmmm. Can I just fast-forward through everything except Jagdeep---and thanks by the way, because I also ADORE Jagdeep to the scorn of many...why? and Ajay? Because I adore him too. Happy 2009 to you too! Shweta - I am so secretly pleased this movie is disliked. There was something about it... and yet I feel guilty disliking it. Beth - Yeah, it's not really worth it. Memsaab - JAGDEEP! How can a person not love Jagdeep?! It's just beyond my comprehension. He was so sweet! Once there's an amputation, it's on!